Copy of an Old Photograph of Hyattstown Mill. The building has changed ownerships and served a variety of purposes since this picture was taken in the year 1900 — notice the saw mill attached to the west side. 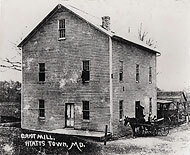 The Hyattstown Mill, located in historic Hyattstown, Maryland, was renovated by the Maryland National Capital Park and Planning Commission and Montgomery County Governent in 1997. HMAP was established in 1999 as a nonprofit cultural arts organization and entered into an agreement with the commission for use of the property as a cultural resource for the community. The mill site includes 2.3 acres surrouding two historic buildings and is located within the boundries of Little Bennett Regional Park. From 1999 through 2005, HMAP, in addition to providing programs in the arts for the region, completed the first phase of a special public/private partnership with MNCPPC and the park that involved completing over $65,000 in site development including improvements to the Hyattstown Mill, the Miller's House and the immediate surroundings. The renovations were directed toward the preservation of this valuable resource for the public's enjoyment and included major repairs to the mill race berm, the Miller's House interior and rehibilitation of its kitchen and 18th century chimney and fireplace. A number of grist and saw mills operated on this site from the late 1700s to the mid 1930s. Due to seasonal changes in the water level Little Bennett Creek proved unreliable as a constant source of power to turn the water wheel. Mill efficiency improved with the installation of steam powered roller machinery around 1905. Following a devastating fire in 1918 the Hyattstown community assisted in the reconstruction using materials from nearby Prices Distillery. 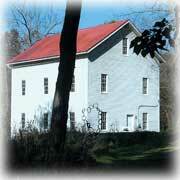 As technology and marketing changed many county mills like Hyattstown Mill closed. The mill has been part of Little Bennett Regional Park since 1965.